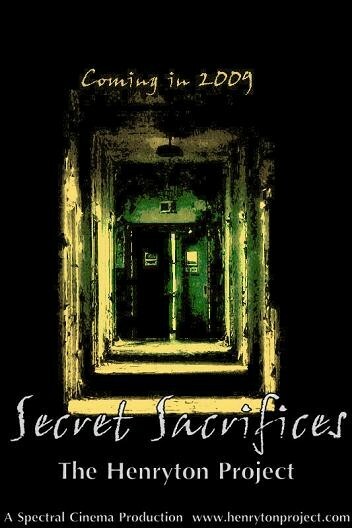 Please continue to check back for updates on the upcoming documentary, "The Henryton Project: Secret Sacrifices". You can visit http://www.henrytonproject.com/ for updates. 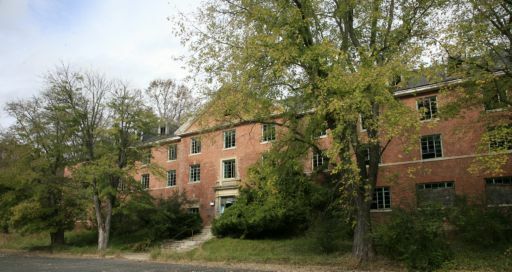 On October 24, 2008, PRRS began the investigation of the Henryton State Hospital. The investigation started with a daytime trip to the facility early that afternoon. Investigators present included Jenny Stewart, David Erickson, Amber Welsh, Kate Bade, and Jen Green. The team parked in a nearby hunting area parking lot and walked the approximately 1/4 mile distance to the hospital. While there are several abandoned buildings on site, we spent most of our time that afternoon in the main hospital building. The investigators all wore respirators, gloves, and heavy boots to protect themselves from the dangers of exploring a building that has been unused for 23 years. 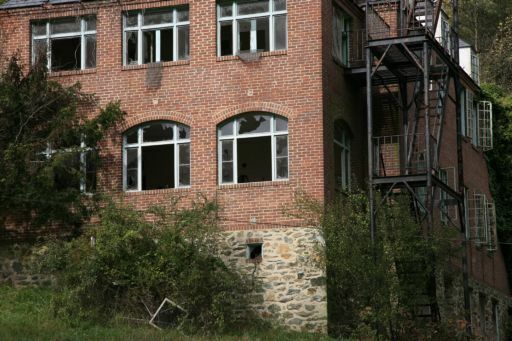 The hospital was found to be in a high state of decay and has been heavily vandalized over the years. Nearly everything that could possibly be broken has been, so our every step was marked by the crunch of broken glass from the windows and broken tile from the walls and floors under our feet. Peeling paint hangs from the walls everywhere you look. There are many places where the floor has caved in completely, exposing the level below. The buildings are full of asbestos, which explains why no one has either renovated or demolished the facility - no one wants to incur the tremendous expense of asbestos removal. As a group, we had one very interesting experience that afternoon. 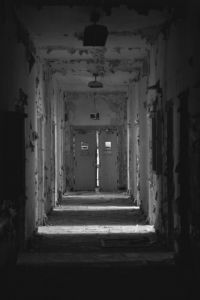 After exploring a large portion of the main hospital building, we all exited through a side door at the end of a large, open room that we had at first believed to be the cafeteria. Once we were all outside, we heard 3 very loud bangs coming from inside the hospital - as if someone were banging on a pipe. Having just been through the hospital, we had not heard or seen any evidence that anyone else was in the building, and believe that it was indeed unoccupied. A few minutes later, we ran into two young men who were walking towards the hospital from the parking area. They carried a duffel bag full of tools, and informed us that they were there to steal aluminum from the window framing with the intentions of selling it. Evidence of other such thefts was present throughout the buildings as we had earlier found electrical boxes ripped off of the walls in order to expose any copper wiring that might have been salvagable. Because of the noise these two were soon making with their tools, we decided to end the pre-investigation and leave. The team returned to the Henryton later that same evening at around 11:30 pm. This time, we drove down the single lane, wooded road that wound through the Henryton complex to park in front of the hospital building itself. We noticed as our headlights swept the front of the hospital that several lights within the building were suddenly extinguished, the occupants probably believing us to be members of the local law enforcement that frequently patrol the area. Because we were not sure who was in the main building, or what they might be doing in there, it was decided that we would begin our investigation in what had been the Administration building. During the course of our investigation, we encountered several other groups on the Henryton grounds. Many of these groups were made up of young people who were there to drink, do drugs, vandalize, or some combination thereof. 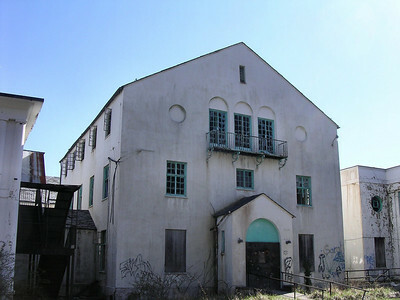 The presence of so many others made EVP work difficult, as it was nearly impossible to distinguish whether sounds were coming from spirits or from someone else in the building. Once we explained what we were up to, many of the people that we met were eager to tell us of their own personal experiences at Henryton, so we spent part of the evening conducting on-the-scene interviews. A ghost box session was conducted just inside the entrance to the Administration Building, at what was most likely the reception desk. At one point, voices were heard to say through the ghost box, "Go now. Cops." The word "cops" was repeated again a minute later. Approximately 20 minutes later, three police cars arrived on the scene. We quickly explained who we were and why we were there, and, not only did they officers allow us to continue our investigation, but they also allowed 3 of our team members to accompany them as they went through the main hospital building to clear it. Once the police left, we continued with a ghost box session that was broadcast live on PRRS Radio. Another paranormal group that we had met minutes before the police arrived went into the Administration Building to investigate. Not wanting to disturb the other group's investigation, we went into the main hospital building, where we did some EVP work and shot some video. We finally called it a night at around 4:30 am, but we all left knowing that there was so much more that we had not yet had a chance to explore. After getting a few hours of sleep, Jenny, Dave, Amber, Kate, and Jen returned to Henryton on Saturday afternoon. It was raining pretty steadily, which made distinguishing any noises over the sound of falling water difficult. The team first went into the Administration Building, where PITT had reported seeing numerous shadows darting back and forth the night before. David and Jen each reported seeing a shadow move across the floor while up on the second floor, but no evidence of this could be found when they reviewed the video. Next, the team moved on to the building that at one time served as the children's hospital in the complex. As we explored the children's building, we had a few interesting experiences. While standing on the first floor, just past a metal stairway that led up to the second floor, Jenny felt as if something had touched her back. Right after that, we all heard what sounded like very distinctive footsteps running up the metal stairs. While upstairs, Jenny entered a large room, and suddenly felt overcome with overwhelming sadness. She said that she could hear a woman crying, looking for her baby, and was sure that the room we were standing in had at one time been a nursery. After her experience in the nursery, Jenny elected not to explore any further. As she and Dave waited in the car, Kate and Amber took a quick look into a building that had served as staff housing. As Kate and Amber stood inside one of the rooms in the house, Kate prepared to take a photo of the door from the inside. As they watched, the door began to close on its own. Upon review of the voice recording they had made, right before you hear Kate say that the door is closing, you hear a voice say, "Don't." Nearly simultaneously, Dave and Jenny were doing a ghost box session outside in the car, and they heard, "No camera." Apparently some of the spirits at Henryton are camera shy. This marks the end of our first investigation of the Henryton State Hospital, but rest assured, we are far from finished! Click here to read about the results of this investigation.